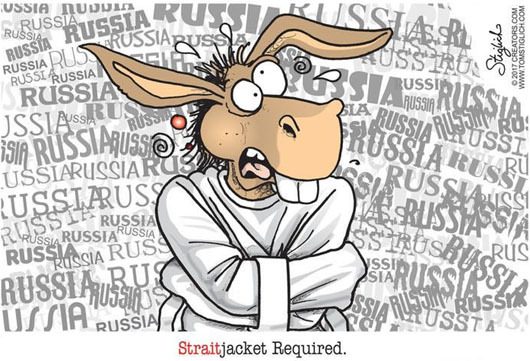 Not long ago, the Left ridiculed what it saw as “right-wing American paranoia over a bogus ‘Russian bear,’ ” a columnist noted. Then-Secretary of State Hillary Clinton played up the “Russian reset,” even famously presenting the Kremlin’s foreign minister with a prop reset button. Now, the Left’s “Russia-is-Satan construct … serves a palliative for hatred of a presidency that so far cannot be stopped before 2020,” Victor Davis Hanson wrote for National Review. The Russia investigation by special counsel Robert Mueller “also serves progressives as a means of psychological projection,” Hanson wrote.